These Pumpkin Chocolate Chip Chickpea Cookies are a great kid-friendly snack! 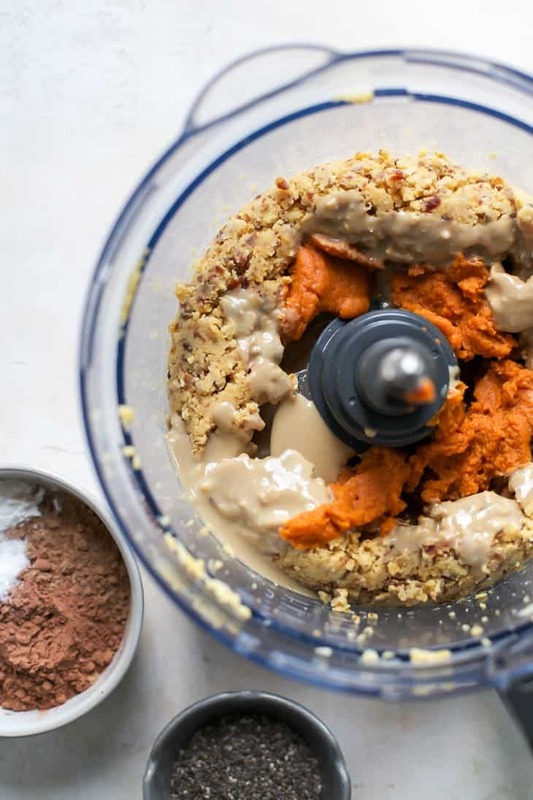 Made with chickpeas, sunflower seed butter, pumpkin puree, and chocolate protein powder. Gluten-free, vegan and nut-free. *Photos and post updated 2018. I’ve recently been going back into the FMK archives and updating some old recipes and posts – hope you don’t mind! I like to think that *most* of my older recipes are still great go-to’s but typically it’s the photography that is lacking. I find recipes that either need a little visual facelift or recipe tweaking, due to that fact I was still in the beginning stages of my blog learning as I went. This recipe was first published in August of 2015 – over three years ago! I can hardly believe it. My photography has come a long way since then and I needed to update the pictures so you could all see what you have been missing! The recipe was actually great as written. The only thing I added was a touch more cocoa powder! This recipe is best made in a food processor so the chickpeas and dates can really get broken down together. If you have a high powered blender (i.e. Vitamix) then you should be okay to use that instead – you may just need to do some more scraping down the sides of the container. 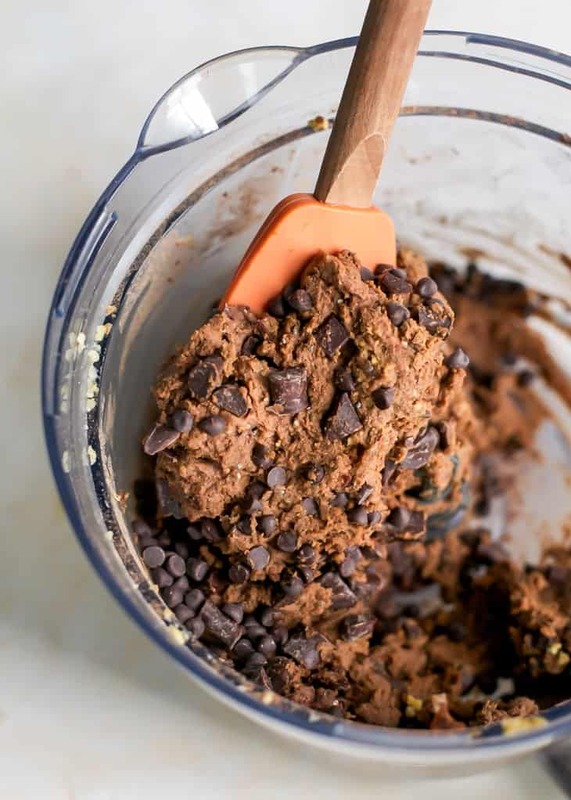 Everything is processed together until the batter comes together at the end, then you’ll remove the sharp S-blade and fold in the chocolate chips. The batter is thick and a little sticky, but the cookies will bake up nicely. Have questions about the recipe? Comment below and I’ll respond here! And if you make this recipe, I’d love if you could leave a comment and review on the blog or Pinterest! 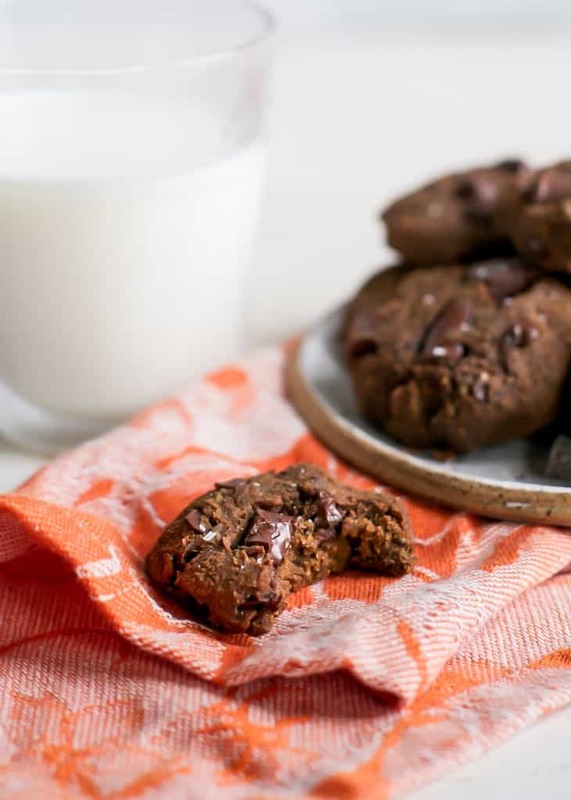 These Pumpkin Chocolate Chip Chickpea Cookies are a great allergy-friendly recipe. No flour used, sweetened with dates, and made with sunflower butter for a nut-free healthy treat. Preheat oven to 350ºF and line two cookie sheets with parchment paper, or a silicone mat. In a food processor or high-powered blender, process drained chickpeas until broken down into flour-like consistency. Add the pitted dates and process completely broken down, about 30 seconds. Add the sunflower seed butter (or nut butter of choice) and pumpkin puree; process again, about 30 seconds. Add chia seeds, protein powder, baking powder and salt and process until just combined. Bake cookies for 11-14 minutes, or until tops slightly crack – cookies will remain soft in the middle. Allow cookies to cool on baking sheet for 5 minutes before transferring to wire rack. Be sure cookies have cooled completely before storing in airtight container in fridge. Cookies should keep fresh in fridge for about 1 week. *It’s best to use a chocolate plant based protein powder here. I did not test with whey. If looking to omit the protein powder, I have not tested this way but I suggest using 1/3 cup cocoa powder total and adding in 2-3 TBSP of a flour like 1:1 gluten-free flour or oat flour. 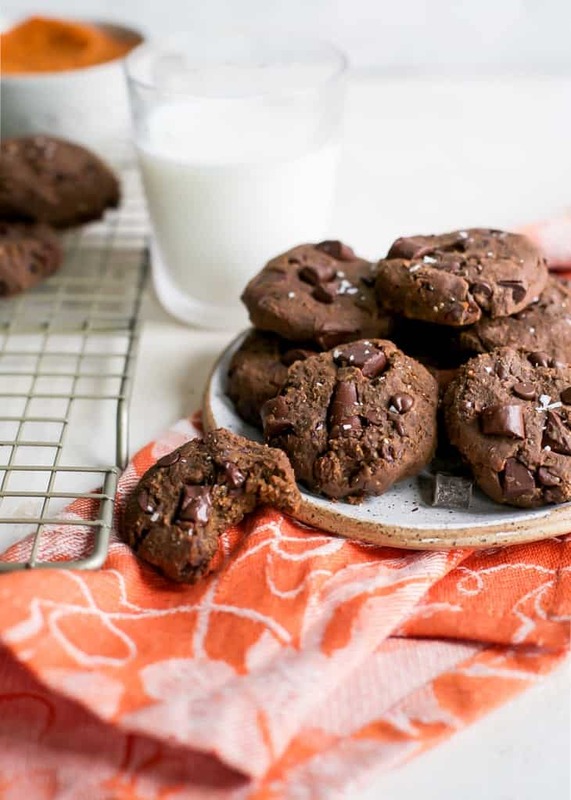 I made these cookies in a food processor, but could be made in a powerful blender as well. 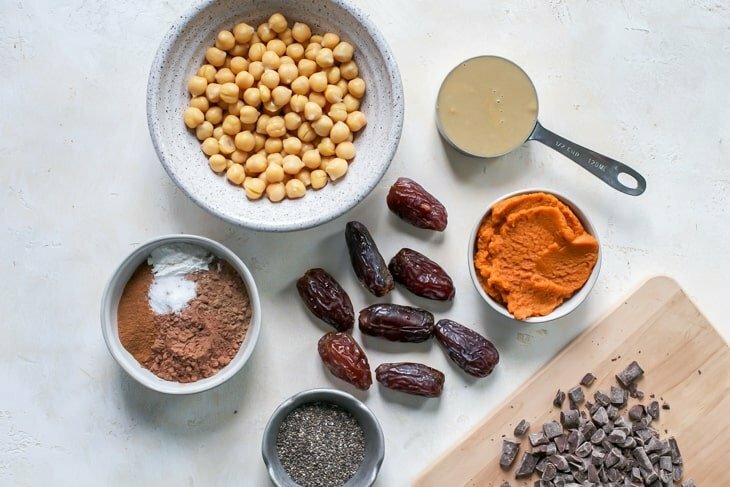 Just make sure your chickpeas and dates get broken down – you may have to scrape down the sides of the blender often. These cookies aren’t super sweet as written but you could add 2 TBSP of granulated sugar (coconut, brown, cane, etc.) if you’d like. These look so good! They must be so moist and gooey. Great after school snack for my kids. I Pinned it for later! They are so good it’s hard to stop at just one! Thankfully they are made with wholesome ingredients so I don’t feel too bad 😉 Thanks for pinning Lisa!! Lets play TOSS THESE DELICIOUS COOKIES in my MOUTH!!! ahhh im drooling thinking of these cookies. i don’t know what i love more – the use of chickpeas or the addition of pumpkin with chocolate! OHMEGAWSH – I ADORE your use of chickpeas in these – they don’t just look insanely mouthwatering, they are making my mouth water! 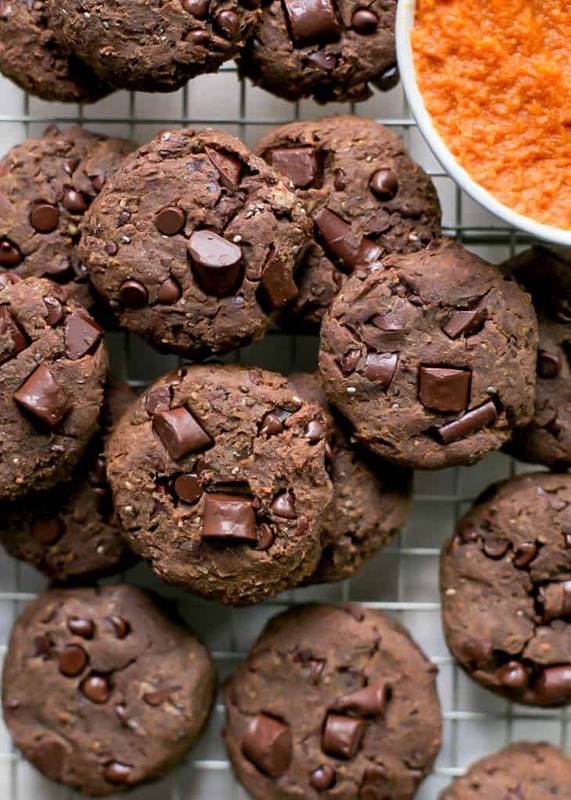 These pumpkin chocolate chip cookies look amazing! Can’t wait to try them for breakfast just like you did …. with almond butter drizzle on top. Yum!! OH MY! This is right up my alley! Funny I just posted my chickpea recipe the other day. YUM!! Hope to make them soon. Great minds think alike! 😉 Thanks, Monica! Yummmm!!! I haven’t dove into my pumpkin stash yet! I’m going to have to start! Yum! Chickpeas are total rockstars and I’ve been loving them in sweets lately. I cannot wait for pumpkin season either so … yeah these are going on my “to-bake” list asap. Pumpkin pie is a classic and probably my favorite pumpkin dessert of all time. Bless you for making cookies with sunbutter! I have a whole jar of it in my fridge and was wondering if there was anything else I could do with it aside from sunshine sauce. Thanks!! And my apologies with the nutrition info. I was using an old recipe card that shared the info but my new one does not. I do still have the info on hand. This is approximate and based on the ingredients I used, as well as counting for the chocolate chunks and chips. Hope that helps! Again, thank you for stopping by!! 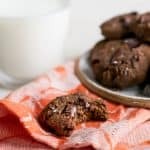 Could these be made without the protein powder? More cocoa? Or …? This recipe looks great! Just out of curiosity, you have an asterisk next to the protein powder but I’m not sure I see where it leads to…am I missing this? Also what do you think about replacing with vanilla protein powder? That’s all I have and I want to make them tonight haha. Maybe do a little less and increase the cocoa powder? Ah sorry for the confusion there! I fixed the protein powder* – it’s just best to use a plant based protein here. Vanilla will work. And yes I would do what you suggest – lessen the amount of protein powder by maybe just a tablespoon but increase the cocoa powder by 2 TBSP. Hope that helps! Hello! I would like to know the durability it, can I leave how many days before eating? Do you need to go to the fridge? I’m from Brazil. Hi there, the cookies should last about 1 week in the fridge. They will keep okay at room temperature, but to be safe fridge or freezer is best. If kept in freezer, they should last about 1-2 months.